LOL, 72 today and now in the late evening lightning and thunder. Rain of course too. No hails, relief. Coffee will be served for breakfast. Buns, salami, butter and black bread. Strawberry jam or marmelade can be offered too. Whatever is in the refigerator you may look for yourself. As my son used to say when he was little, "I've got the gray day yuckos." It was windy, chilly with rain and misty rain all day. We even had some thunder this morning. The temps are on a roller coaster ride. In the upper 70s Sun, and Mon.. It didn't even hit 55 today. It's supposed to be more springlike this weekend. I just hope it sticks around. Going to hit 50 today, 70 tomorrow, and then sunny and 80 Friday and Saturday! Just took a walk to Dunkin Donuts with some coworkers to get some breakfast and it's still a tad chilly outside. Whoever is responsible for the weather has an irritating taste. Question is, if there has somebody has conducted bad weather ceremony. Ten degrees less than yesterday, gray low clouds, no sun can be seen. Well, come in, coffee is ready. I'll have some fine Ruebenkraut with butter and buns or bread. We call it Zuckerruebenkraut (sugar beet herbage) or Rübenkraut. Sweet and quite fluid. Can be used as a sort of glue. 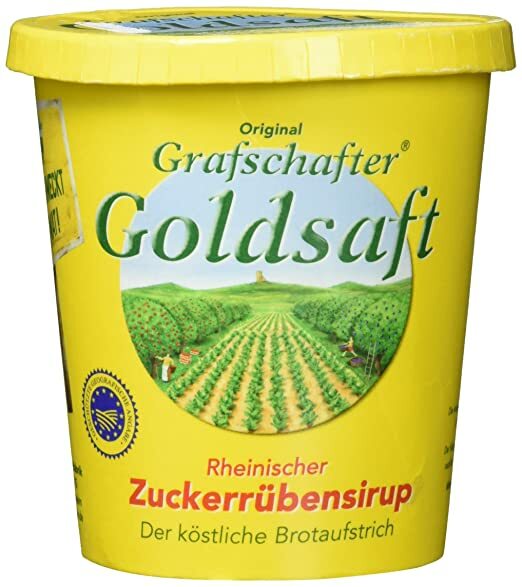 The various kinds of rübenkraut/zuckerrübensirup are similar to the English golden syrups and treacles. Personally, give me sorghum molasses and biscuits. Please give me some time to get you sorghum molasse. It is not in the kitchen stock yet. The supermarket around the corner doesn't have it. May be I get it at the wholesaler Metro in the local branch, if not at his Düsseldorf branch and headquarter. Oh, that I have in the kitchen :) I buy a jar whenever I'm in TN for class. The golden syrup is harder. I needed some this Christmas for my black rum cakes. Thank heavens for Amazon. :) golden syrup is easily available. With amazon it is easier than before amazon. I recognized with books. It was still chilly today, but the sun was out, so that's a huge plus! Work has finally slowed down from the chaos of Spring/Easter break travelers. Some of those people were just flat out rude. I had to restrain myself a couple of times from telling guests that it wasn't my fault they decided to blow 6 mortgage payments on a trip to Disney World. Some of those people were just flat out rude. I had to restrain myself a couple of times from telling guests that it wasn't my fault they decided to blow 6 mortgage payments on a trip to Disney World. You should know that such trips are not without excessive fees. Customers can be difficult, very difficult. Sigh. Caffeine! For the love of all things holy, caffeine. We're getting ready to switch our source version control system from Subversion to Git. I'm reading tutorials and watching videos on Git. If anyone has intractable insomnia I have a cure: Read three blogs with beginning Git tutorials, follow it with a couple of you tube videos on Git. You'll be falling face first onto your desk in under 20 mins. Hot coffee or better pure caffeine for injection? I do not want to read any further. What can I do else for you? There is medicine for not falling asleep. Yes to the caffeine! Wawa, one of the local convenience store chains around here that is rapidly taking over the East coast, had their birthday today and offered free coffee. The coffee did nothing for me at all. I think the weather suddenly changing today is causing me to feel tired as well as give me a pressure headache. Tomorrow and Saturday will be 80 here and then it's back into the 60s on Sunday and through next week. I'm an Allsups and Buc-ee's fan. I'm addicted to Allsup's Hatch green chile and cheese tamales. (No roller grill involved.) Get 'em out of the freezer case and take back to your hotel to microwave. Cheap travel meal. In my grad school days, I ate those suckers in more cheap hotel rooms than I care to count. Now with Buc-ee's it's all about the epic, luxurious -- clean! clean! -- restrooms. The one between Dallas and Houston has 87 commodes. Even the Weds before Thanksgiving there is no line outside the Ladies. WAWA is invading down here, too. I think that is really a dumb name for a store. LOL! Your weekend weather is sounding a lot like ours. Sunday is supposed to be quite stormy. The Kindle and I (and probably Princess Chatty Cat) will be hanging on the back porch reading. This cat just showed up a few months ago, and she has a princess attitude. She can also open the porch door herself, and butts her head against it to go out, so...she stayed when she showed up. She's a rather pudgy calico with a loud mouth. Wawa is the name of the town where the original dairy was and where their current headquarters is but the name itself is derived from the Ojibwe (?) word for what we call the Canadian Goose thus the store's logo. I need some extra strong coffee today. Went to a proper coffee shop (not Dunkin or Starbucks) and paid $5.38 or a large latte with some mocha and vanilla flavor in it for fun! I still don't think that is enough for me, may need more espresso. I think you may try out "Jacobs Krönung" (Jacobs coronation), sometimes called "Jacobs Dröhnung" (Jacobs high). Without milk deeper black than the deepest see at ground level or a black hole. If you wonna have it extra strong, use some more spoons of that coffee powder for brewing. Can I do anything to prevent Rose from hurting herself? May be a soft buffer to foreclose hard hitting the desk? seems partly like our Real REWE and Lidl, Aldi, Netto. To me, it seems Buc'ees is like a large gas stations with extra large stores and hotel? Something you find at the rest areas of our Autobahn but much smaller. LOL They have Sanifair and charge you 70 Cent for using it. But at least they are clean while the public toilets you'd better avoid. They are on the rest areas without gas station. No hotel's at the Buc-ee's. Just miles of snack food, some darn good fudge, acres of gas pumps, and miles of potties clean enough even for my mom to use, who has a bathroom cleanliness fetish that forces her to visit public restrooms with a container of Lysol disinfecting wipes and many pairs of gloves.